Yosemite in the snow is a total dream of mine, so I was so stoked to be able to experience it. Having the opportunity to photograph Yosemite in a state so much different and more beautiful than it is in the summer was incredible. Since it was raining pretty hard most of the day, Katie, Jake and I just drove to Valley View and Tunnel View to do some quick shooting instead of going on a hike. 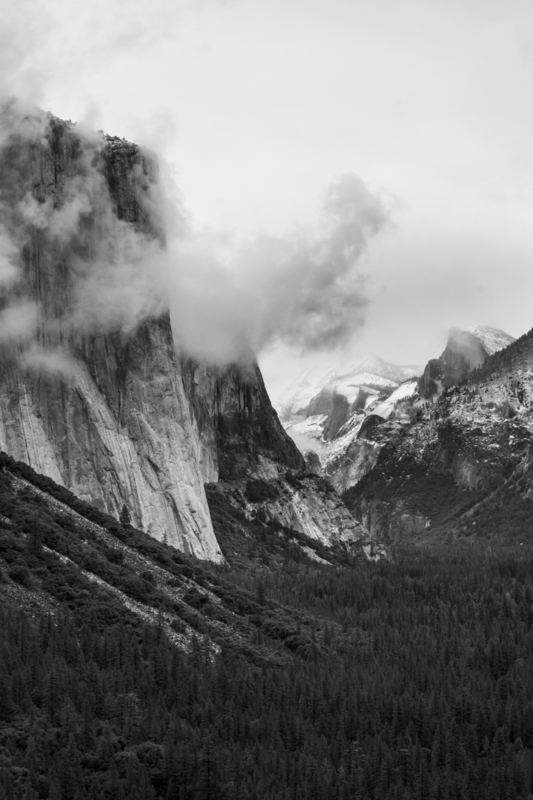 This is probably my favorite panorama from my week in Yosemite. There's something inexplicably gorgeous about El Capitan behind some light clouds and Half Dome covered in fresh snow. There were wedding photos and videos being taken at Tunnel View while we were there, so I couldn't resist but snap a few shots!